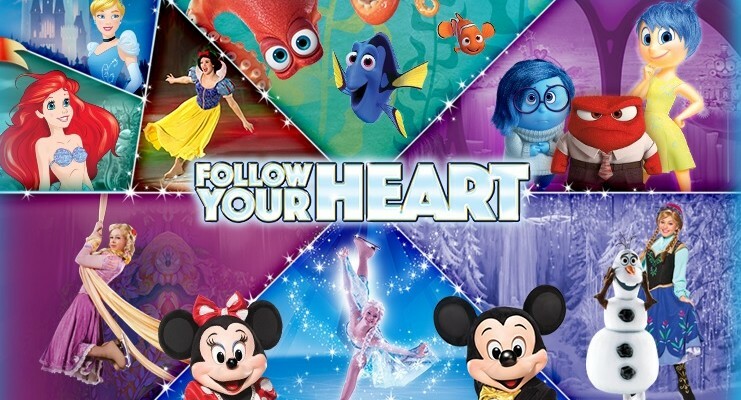 My kids and I are so excited to see Disney On Ice presents Follow Your Heart! This amazing show is coming to the Eagle Bank Arena this April, and I am giving away tickets to the show! Just keep swimming with Dory, Nemo, Marlin and new pal Hank from Disney•Pixar’s Finding Dory as they embark on a life-changing excursion to find her parents and discover the true meaning of family. Cheer with Joy, Sadness, and the rest of the Emotions from Disney•Pixar’s Inside Out as they help Riley find the confidence to win the big hockey game. Venture to wintery world of Arendelle where Olaf and Kristoff help reunite royal sisters Anna and Elsa from Disney’s Frozen and learn love is the most powerful magic of all. See Cinderella, Rapunzel, Tiana and the Disney Princesses make their dreams come true through their virtues of bravery, kindness and perseverance. And celebrate true friendship with Buzz Lightyear, Woody and the Toy Story gang. Enter to win a family 4 pack of tickets to see the show on opening night, April 12th! For show details and discount flyer, check out this post! While you wait for this show, have some Disney On Ice fun with these Trivia Questions! « Smile. Sparkle. Shine. Giveaway! My girls say Mickey and Minnie…and all the princesses!! My son loves Dory! I like Woody and Buzz! MY daughters would love to see OLAF! We love all Disney characters!! We love Mickey and Minnie! So nice! Love toy story! My 2 girl would love to see all characters!